Every four years soccer world is celebrating. FIFA World Cup is not just a common tournament. It is the tournament of tournaments. This year the World Cup will be played in Russia from June, 14 till July, 15. We, in SOCCERsoda.com, like soccer and like to play. Therefore we thought hard over the probable outcome of upcoming World Cup. 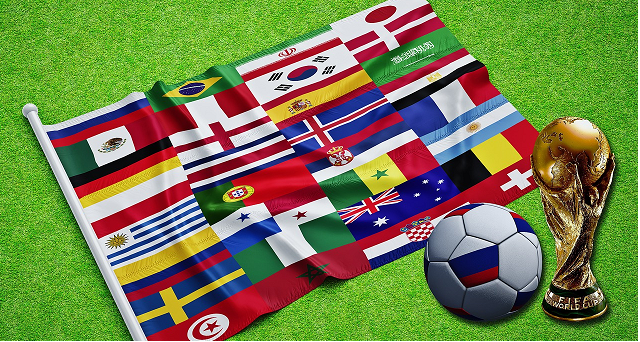 Hope you will enjoy our Bold FIFA World Cup 2018 Predictions as much as we like writing them. FIFA World Cup 2018 Predictions – Finals – Who will win FIFA World Cup 2018? Predicting the outcome of FIFA World Cup is a pretty tough thing. Just imagine, there are just eight countries who won FIFA World Cup in the past. Really, just eight winners in the past. That means that even reaching the final or semifinal is a big thing for any participating nation. Believe it or not, even teams (if you are not Brazil or Germany) finishing at a 4th place can count on a big celebration in front of crowds when coming home. The old rule says that when World Cup is played in Europe than European team is winning (with the exception in 1958, when Brazil won World Cup held in Sweden). Till 2010 all FIFA World Cups played outside of Europe were won by a South American team. However, Spain in South Africa 2010 and Germany in Brazil 2014 canceled this rule. This group looks like an easy bet. Uruguay has a pretty impressive squad full of players with experience from La Liga and Seria A. Winning Group A for Uruguay is just a first obligatory step for them and Russia, Egypt and Saudi Arabia should not be a real threat. Uruguay can lose a point or two in a group, but it would be a big surprise if they lose a match. Two of big favorites of World Cup will meet in one group in their first match on June 15. Spain and Portugal should play a big role even in knock-out phase so nobody doubts these two teams will take first two places in Group B. Who will win the group depends on the outcome of the first match which is pretty hard to guess. Overall taking into the account possible results against Morocco and Iran, we prefer Spain little bit more for first place. Group C offers one clear favorite. And that is France, of course. One clear outsider, which is naturally Peru and two contenders for second group place. Australia or Denmark? We never underestimate Australian team but Denmark seems to be the better team at the moment. This group is not easy to predict. Argentina looks like the favorite, but Croatia and Nigeria are strong contenders too. Iceland does not look like a threat to the above-mentioned trio, but remembering their excellent performance during Euro 2016 should give us a minute for thinking about results again. In the end, we will be a little bit bold as our title says it. Germany in the group means, that you have to pick Germany as a winner. Mexico looks always good in every World Cup. Sweden was able to beat Italy in qualifying but their performance was so heroic, that it will be hard to repeat. Korea team is a big unknown for me, but we do not expect they will endanger Germany or Mexico. Most fans would pick Belgium and England for first two places in Group G, but we see more drama in this group. England will show young team in Russia, so some surprises are possible. Just Harry Kane and Delle Alli will shoot them in knock-out phase, leaving Tunisia sad. I would like to see some African team in Round of 16, but Senegal will face too strong opponents in Colombia and Poland. Japan will play they usual football with a lot of an effort, but skills are missing there this year. Colombia will be stronger than it looks on paper and will overcome Poland in Group H.
What to do when your kid starts with soccer? Check our guide for all you need to know when your kid starts with soccer! Our group predictions were probably not as bold as you expected, but we promise now it is time for a change. The pairs are derived from our group standings predictions. What a match. Whoever loses it will be hardly missed. We love Leo Messi, but France will be a too tough opponent. Cristiano Ronaldo will do everything to win World Cup, but we see Portugal team not good enough against Uruguay. This will be the end of the World Cup story for the home team. Spain is too strong almost for everyone not just for Russia. Croatia will be a black horse of FIFA World Cup 2018 and even good Denmark performance will be not good enough. We promised to be bold and here it is. Mexico can finally do it. Belgium was a team of future two years ago and now they are a team of the present. Their time is definitely now. No chance that younger brother will beat the older one. Surprise for many, but not for us. This England team is not the threat. This can be the match we will remember for years. A lot of offensive and lot of goals. In the end, we like France little bit more. We would wish Mexico success, but with the clear mind, we know that Belgium will be too much for them. We say bold prediction and here it is. Spain is good, really good, but not as good like five or six years ago. Croatia has plenty of talent and also experience. If everything “clicks in”, they can go further. Germany knows how to play important matches. That is all we need to say about this quarterfinal match. We will see all European semifinals in July. Maybe bold, but it is our prediction for FIFA World Cup 2018. Both teams are very talented, both have plenty of experience (maybe France little bit more). And experience will probably decide this match. Germany usually wins such type of matches, when everything is in the stake. But now, we have such strange feeling. This year it could be different. Croatia always looks promising, but this year they finally deliver. FIFA World Cup 2018 Predictions – Finals – Who will win World Cup 2018? Match of disappointment usually brings weak defense and lot of goals. And in the crazy matches more experienced team will win. Will we see 9th nation to celebrate FIFA World Cup win? We say no. France is just a little bit better.